Many product designers practice user-centered design, carefully considering the user’s interaction with the product. However, it’s important to not simply consider the primary user, but also the users, or actors, throughout a products life cycle. By thinking beyond the primary user, you can often uncover unique features that may improve the product and provide a market advantage; extending design considerations to actors involved in assembly, service, selling, installation and even end-of-life disassembly. I often relate a story that highlights the power of thinking beyond the primary user. We were working with a company who offered a line of flat screen TV mounting products at a time when the category was still defining itself and very competitive. We were exploring ways to gain market advantage; lower profile, refined fit and finish, smoother adjustment, easier installation… When looking at all of the users of the product life cycle, we noted that many of their customers were professional AV installers. We suggested that we look at the out-of-box experience to help make the installation process more organized and quicker. Maybe we could even make the installation less intimidating for the DIY user as well. We were excited about this opportunity and presented the idea of designing the installation process to our client. They didn’t share our level of enthusiasm and said that they would pass on the proposal. We felt strongly that the installation process was a key part of the user experience and took a rare step. We offered to do the project for no fee if they choose not to implement the design we presented. Taking a high-level look at the installation process, all of the parts, tools, and steps, we discovered through user observation that the most challenging aspect was of installation was determining the positioning on the wall. Finding studs, making sure it was level, etc. was intimidating, took time and is where mistakes were made. Our solution was to organize the instructions in the form of a template that contained everything that was needed; measurement grid, step-by-step illustrated instructions, stick pin to mark the center, level, double stick tape, and best of all, a fold-up tray to catch the dust from drilling. 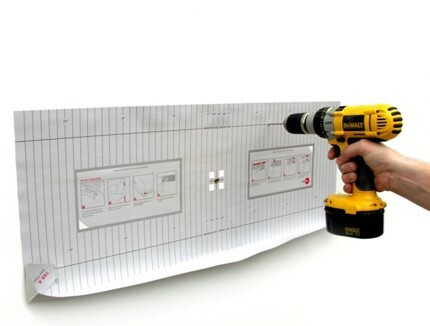 The template provided everything needed to simplify installation: push pin for the center point, double stick tape to fix the position once level, dimensional grid for drill location, step-by-step info-graphic instructions and dust collection tray. Shortly after we presented our solution, the client hosted a focus group introducing new product concepts to professional AV installers. When the presentation of the new packaging and installation template was demonstrated to the group, there was an actual standing ovation. The installers appreciated that they were considered in the design process. The installation kit went on to become a standard feature of each mount in the line and a signature of their brand. Info-graphic step-by-step instructions appear on the template for easy reference during installation. User-centered design is good design and important to every project. Considering all of the users in a product’s life-cycle can give you a market advantage.